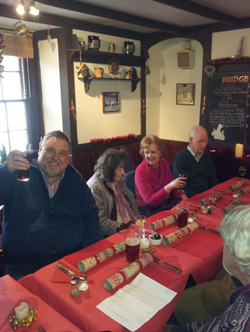 ‘This year Agan Tavas had Christmas lunch at the Bridge Inn near Redruth. It was the first time that the society have held their lunch here and it was a great success. We were attended by the hostesses, Julie and Sandra, who prepared the society’s best Christmas lunch ever. There was plenty to eat and a number of choices for those who preferred not to have the normal Christmas fare. We can recommend the pub to others of course.